I have had dry and fly-away hair for few years now (Thanks to Canadian winters and of course flat irons) and nothing seemed to work until I tried your shampoo & Conditioner. 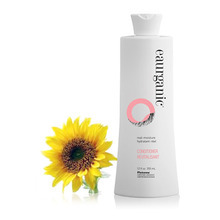 Since I have been using the eaurganic products Not only did it make my hair shiny and unbelievably healthy-looking, but it also conditioned and gently controlled my fly-away hair without any dulling hair spray or styling gel. Also, without any other products, my hair finally had the volume and the sheen. 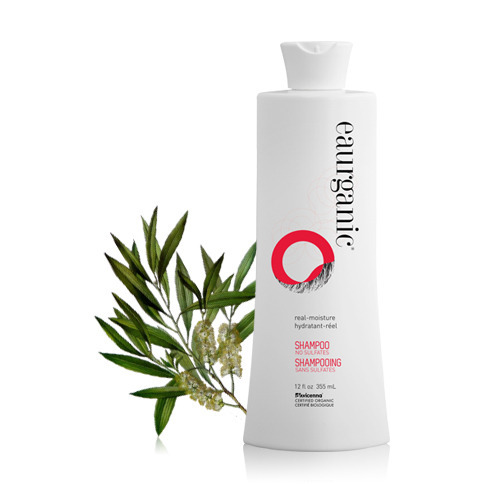 An ultimate organic hair shampoo to restore and nourish dull and damaged hair, best for dry and sensitive scalp. real-moisture SHAMPOO is a highly moisturizing, non-sulfated formula made of natural base surfactant infused with vegetable protein and natural vitamins to clean the hair, adjusting the production of the scalp's natural oils, and promoting healthy hair growth. So not only does it clean out dirt and oil, it returns much-needed moisture for good hair and scalp health. To produce real-moisture SHAMPOO, extracts of Chamomile Blossoms produced in Bayliss ranch of Northern California have been used. Organic Glycerin is an excellent moisturizer of the hair and scalp. Hydrolyzed Jojoba Esters improves the quality of the hair and protects against the harsh effects of heat drying and ironing. Vegetable Proteins provide effective repair and restructuring of hair cuticles, which boosts volume and heals damaged hair. Organic Rosemary essential oil has antibacterial, antifungal and anti-parasitical properties. Rosemary is also used in aromatherapy to help uplift the spirits and ease muscle fatigue. 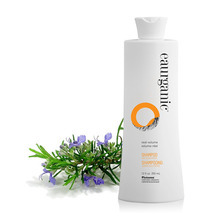 Organic Chamomile Blossoms Extract is used to impart brightness and shine to hair. There is also some evidence that chamomile could reduce hair loss. Our mix of natural surfactants is mild and sulphate-free. These surfactants remove dirt, oil and buildup gently without irritation. Our mix of natural humectants is effective at moisturizing the scalp, adjusting the production of the scalp's natural oils, and promoting healthy hair growth. AQUA/ WATER/ EAU, SODIUM COCOAMPHOACETATE, GLYCERIN*, LAURYL GLUCOSIDE, SODIUM LAURYL GLUCOSE CARBOXYLATE, COCO-GLUCOSIDE, CHAMOMILLA RECUTITA (MATRICARIA) FLOWER /LEAF/STEM WATER*, GLYCERYL OLEATE, GLYCERIN, ERYTHRITOL, CITRIC ACID, DICAPRYLYL ETHER, HYDROLYZED WHEAT PROTEIN, HYDROLYZED JOJOBA ESTERS, JOJOBA ESTERS, SODIUM BENZOATE, POTASSIUM SORBATE, natural FRAGRANCE°, CHAMOMILLA RECUTITA (MATRICARIA) FLOWER OIL*, ROSMARINUS OFFICINALIS (ROSEMARY) OIL*, MELALEUCA ALTERNIFOLIA (TEA TREE) LEAF OIL*. The real-moisture SHAMPOO is so gentle you can use it every day if you want. Use it as the first step in your hair care regimen. Step 1 – Pour a liberal amount of shampoo (3-5 mL) into your palm and work it into your hair. Step 2 – Massage the shampoo into your scalp and feel the invigorating rosemary and chamomile oils do their work. Step 3 – Once your shampoo is thoroughly worked into your hair and scalp, rinse it out to wash away the dirt and oil. We recommend you repeat these steps. The first wash removes all the oil buildup and dead skin cells; the second wash will give your hair and scalp that squeaky clean feeling. But don't stop there. You want your hair to shimmer like starlight? After you shampoo, use thereal-moisture CONDITIONERto make your hair soft, bouncey and super shiny! Our real-moisture SHAMPOO is a Certified Organic product that uses the finest organic ingredients to both clean and moisturize your hair. The shampoo contains a well-balanced mix of natural surfactants and humectants to achieve optimal cleaning and moisturizing effects. So not only does it clean out dirt and oil, it returns much-needed moisture for good hair and scalp health. Our ingredients are sourced from nature according to the strictest standards, so you can be guaranteed that they are free of sulfates, parabens, GMOs and other nasties. These ingredients include organic Glycerin, Hydrolyzed Jojoba Esters, Vegetable Protein, Rosemary Oil, Tea Tree Oil, and Chamomile Blossoms Extract. Each of these ingredients provides a different benefit to your hair.